Mountain lion Ash and his sister, Cypress, were born in California in 2011. It was estimated that they were 3 to 4 months old when their mother was legally killed, leaving the cubs to survive on their own. By the time they were found, they were in bad shape; both were starving. Cypress was found first, suffering from a fractured jaw and a broken leg. She was taken to the Folsom Zoo for emergency treatment. When Ash was discovered in the same area, he was also taken to the Zoo. The two immediately began to call for one another and it was apparent that they were siblings. They were closely bonded and the Folsom Zoo had room for only one mountain lion, so a search began for a home that could take both brother and sister. Southwest Wildlife was that home. Ultimately Cypress couldn’t overcome the injuries and medical struggles resulting from her time of deprivation and passed away. Ash, always her protector and the stronger of the two, has flourished and grown into a magnificent young mountain lion. 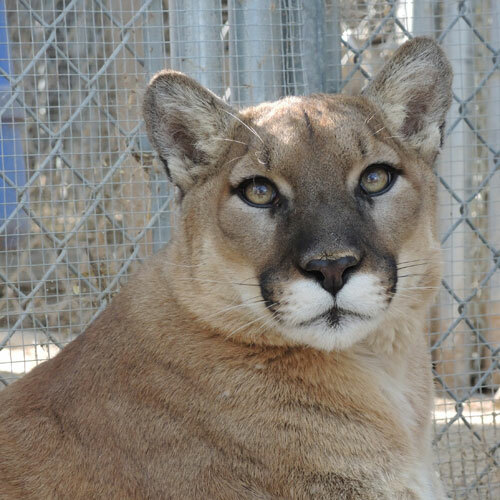 We introduced Pecos and Kino, two older male mountain lions who lived in the neighboring enclosure, to Ash last year. The three of them are getting along well and are enjoying having twice the space to hang out and explore.